Richmond Recognized as 2016 Playful City USA! The City of Richmond received KaBOOM’s designation as a 2016 Playful City USA. This designation, the first of its kind for the city, is the result of a partnership between the City’s Department of Parks, Recreation and Community Facilities (PCRF), the Capital Region Collaborative, and Active RVA. 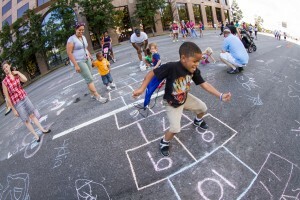 KaBOOM’s national recognition program honors cities and towns across the country for making their cities more playful.